WataugaWatch: Federal Judge Tells Trump, "You Can't Deny These Troops the Right To Die For Their Country"
Federal Judge Tells Trump, "You Can't Deny These Troops the Right To Die For Their Country"
Federal District Court Judge Colleen Kollar-Kotelly has blocked Trump's ban on transgender troops. If you're keeping a box score, this is yet another of Trump's unconstitutional orders knocked down by federal judges, including the order limiting travel from Muslim countries and his attempt to punish so-called "sanctuary" cities. The plaintiffs? Yes, a group of five transgender women serving in the Coast Guard, Army, and Air Force brought the lawsuit. According to Dave Phillips, "Many of the women had served for years as men and had been deployed to war zones before coming out to commanders when the [transgender] ban was lifted in 2016 [by President Obama]. One is a few years from retirement, according to court documents. Another told her commander she wanted to keep serving, but would resign if the military moved to forcibly discharge her." 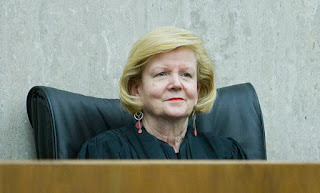 Judge Kollar-Kotelly, incidentally, was first appointed to the bench by President Ronald Reagan. Put them on the front lines, the first into battle. Then maybe you'll support ending these wars. Anonymous (he/she who is reluctant to reveal their identity) wrote: "Put them on the front lines, the first into battle." I suggest it should be the children of the politicos and the 1% who should be sent to the front lines. As usual you're missing the point.